My husband and I had been working on Lilly's nursery from when I was about 8 weeks pregnant. Some may say that starting so early is bad luck but we couldn't contain our excitement. 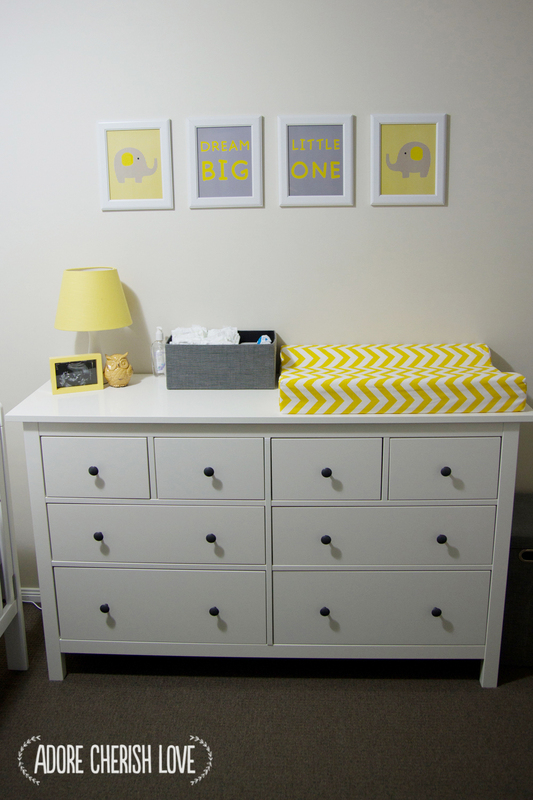 When the beautiful chest of drawers went on sale at IKEA for almost 50% off, we couldn't pass it up so the nursery preparation began! By the time I got to about 25 weeks, the nursery was practically finished. We were just waiting on our beautiful wall decal to arrive and of course it arrived while I was in hospital with Lilly so my amazing husband put it all up one night after visiting us. I will never forget the feeling when I walked into the nursery the night I got home from hospital - it's such an amazing and relaxing space that I know Lilly will love growing up in! 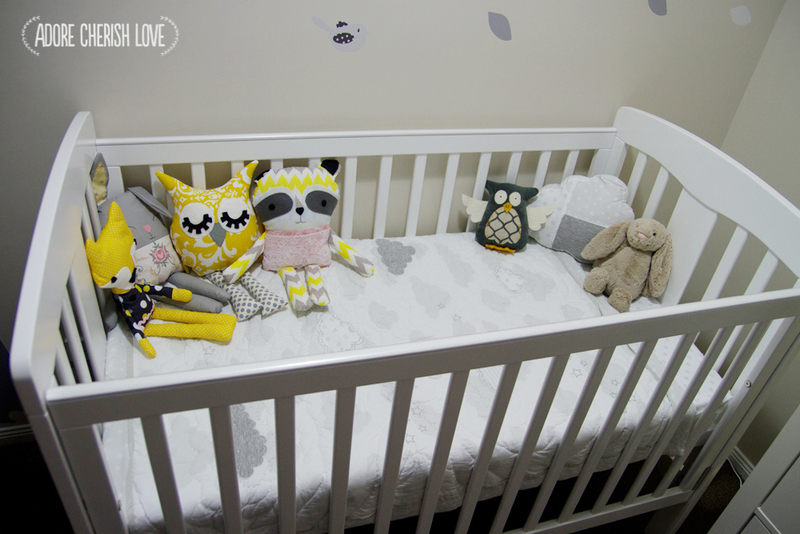 The beautiful yellow and grey stuffed naimals in her cot were made by my very crafty Aunty for my baby shower! 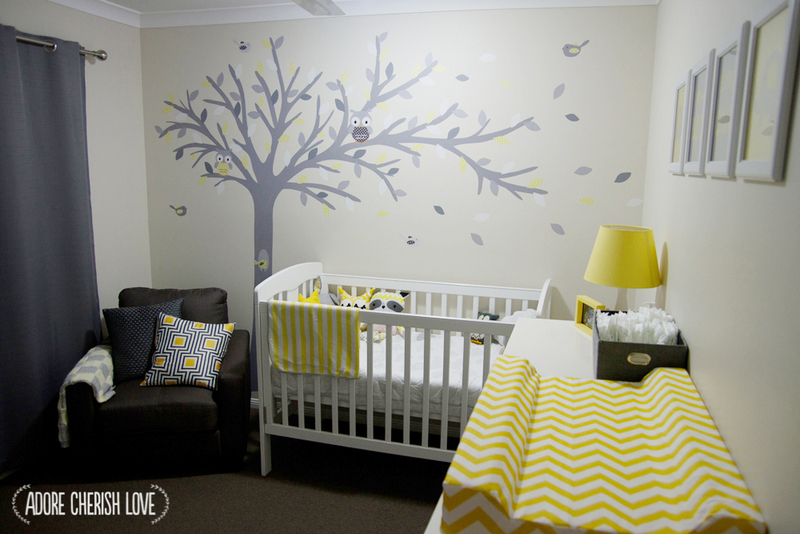 I designed the 'dream big little one' prints myself and printed them off at officeworks. The gorgeous chevron change pad cover was made by my very clever Mum and the yellow and grey knitted blanket drapped over our chair was made by my clever Mother in Law. Lilly's room is filled with handmade goodies by some of the people that love her the most - isn't she lucky? I can't wait to bring her home and into her nursery!! !